Orange leaves falling off trees and black skies creeping in on the way back from work, these are definitely the colours of October and with October comes Halloween . So instead of being down that summer BBQs are behind us let’s embrace our winter coats, turn the heating on and get everyone round. No need to wait until Christmas to decorate your house! 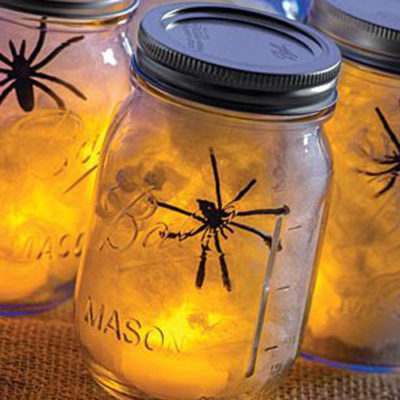 It’s already too cold to be anywhere else but inside, here are 5 frightfully easy ideas for Halloween party decorations. Right so you’re having a party and you want your pumpkin to be the star of the show but in actual fact you haven’t got the skills, patience or the time to clean up afterwards. 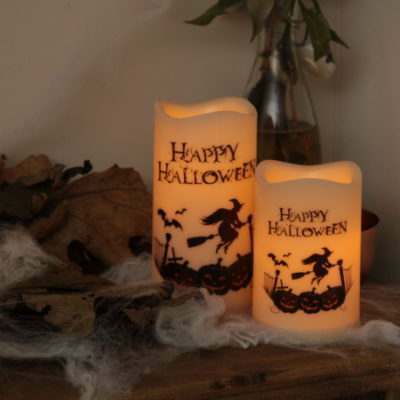 Take your uncarved pumpkin and some battery powered fairy lights and tacks, then starting from the stalk spiral your lights down and around placing tacks every now and again to secure. There you have it no muss no fuss no mess but a decoration to be proud off. Although this idea may be a little bit messier than the last, it still doesn’t involve any kind of scooping. 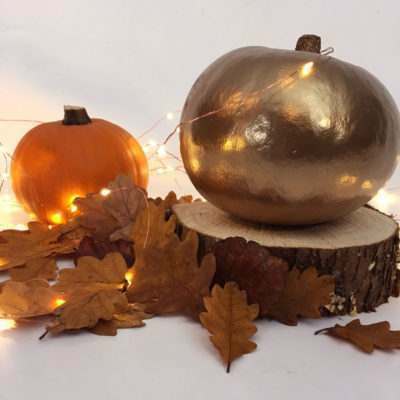 For this sparkling pumpkin you’ll need orange glitter and some PVA glue or spray adhesive. You can probably guess where this one is going… simply take your pumpkin cover it in glue (or for a perfect finish work section by section) and sprinkle on your glitter. It’s as simple as that, but make sure you have covered your surface first as you don’t want to still be finding orange glitter on Christmas day. Now this pumpkin does involve some light manual labour but not a huge amount of skill. First take your large pumpkin and cut it in half, for this you will need a sharp knife and some muscles. Next remove all the inside, at this point it is usually best to repeat the phrase “it will be worth it in the end” over and over again. 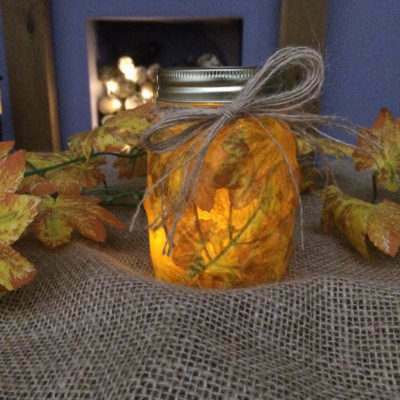 Now your pumpkin is empty you can place in a large glass bowl followed by lots of ice and bottled drinks. Next we’re moving away from the orange and on to the black, for this you’ll need a steady hand, black card, a bat template, some scissors and blu-tack. Start by cutting your bats out of black card using your template, cut out as many as you want depending on where you want to display them. 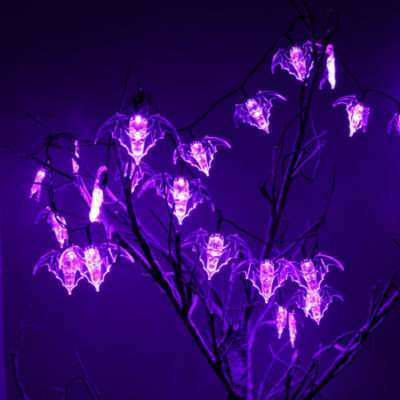 Once you have cut out all your bats you can fold each one in half for a 3D look, finally blu-tack each one to your surface for a truly spooky display. 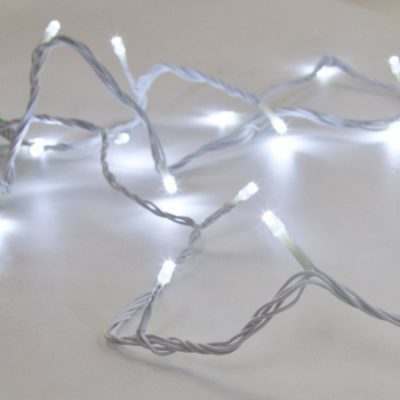 Now maybe you’ve read all of these and thought “these sound great but I still don’t have the time”, well in that case take advantage of the fact that all the leaves have fallen of your trees and get yourself some spooky fairy lights to string though the bare branches or even just place them around the house. 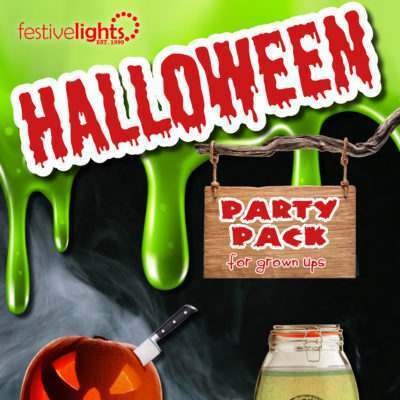 Got you in the mood for a halloween party? 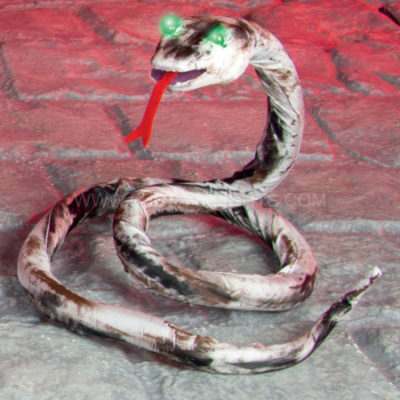 Take a look at our range of lights and see if you can think of any more creative ideas to decorate this year.